The province has moon soon weather, cold winter. The annual average temperature is 24oC. The highest one is 30oC in July; the lowest one is 15oC in January. The annual average rainfall is 1,400mm3- 1,600mm3. The rainy season lasts from May to October and the dry season lasts from December to April next year. 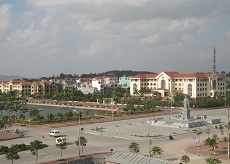 Bac Ninh used to be an ancient town, a trade centre of Vietnam from 2nd to 10th century. Buddhism penetrates into there early and flourished on Ly dynasty.Bac Ninh has tangible and intangible culture heritage. Many pagodas and temples were built such as Phat Tich, Dau, But Thap pagodas, Dinh Bang Communal House, Do Temple. Bac Ninh is cradle of Quan ho folk-song. The popular festivals take place in many pagodas, temples and communal houses, especcially they usually are orgazed in spring. Bac Ninh has some tradition handicraft villages such as Dong Ky Wood, Dong Ho Pain, Dai Bai Bronze, Phu Lang Pottery.